The roofers at Empire Contractors have a lot of skill in roof restoration. We have been in this industry for more than 20 years, so we know what’s best for you and your roof. Roof coatings are good service to help you with saving time and money on your roof. We provide this service to customers in the Ludington, MI area. To schedule a time for us to stop by and inspect your roof, contact us today at (231)-861-7221. When it comes down to it, you shouldn’t be repairing your roof constantly. Eventually, you will have to make a choice between restoring your roof or fully replacing your existing roof. Mostly, it is an advantage to restore your roof instead of fully replacing it for a number of reasons. One big reason is that roof coatings are very cost effective compared to roof replacements. Your roof will be waterproof for another decade if you get a roof coating. The seamless membrane will help to improve the condition of your roof and it will prevent your roof from leaking. Additionally, this service isn’t as disruptive as a full replacement and your business won’t have to be halted. A roof coating will cover your roof fully. The membrane is a reflective surface that will protect your roof from the sun and rain. Because it is reflective, it will help you save on your energy bills. You will be able to pay 33% less on your buildings energy costs, this will wind up paying for itself in the years to come. 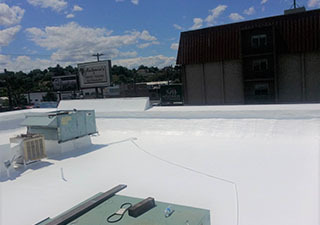 After we inspect your roof, we will tell you if you can get by with a roof coating or if you need to replace your roof. 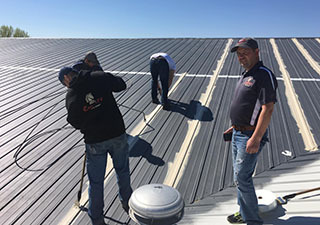 No one likes replacing their roof, but we make this process as easy as we can for our customers. Our roofing specialists are experts and will offer you a replacement as quickly and cost effectively as possible. A coating is the best way for you to save money. If you restore your roof it will last you a lot longer and you won’t have to pay for a replacement as quickly. Contact us today at (231)-861-7221 for a free onsite roof inspection.